If you remember from my last post we were in Kirkwall, Orkneys for two nights to wait out a gale. Weather intermittent sun and rain but the wind blew hard from the south for the entire time and since we were on the northern side of our dock we were being blown away from our mooring, well that we had doubled our mooring lines. One advantage of being moored for two days was the opportunity to find the town’s laundromat and clean up a 2 week accumulation, bliss. We were hoping to sail to Stromness to our south which would prepare us for a straight southerly run into Ullapool but the winds coming so hard from the south, we could only clear the harbour by sailing north so after lunch on Thursday we raised sails and headed north for Rousay, a small Orkneys island nicknamed the Egypt of northern Europe. Struggled to make sense of the nickname, flights of imagination attempting to connect windswept, sheep-filled islands with pyramids and desert sand but just couldn’t make it work. I was to discover that the reference arose from the discovery of neoolithic tombs which were built by early inhabitants over 5500 years ago and which, in fact, pre-date the pyramids. I’m anticipating however. Inside a 5500 year old burial chamber, covered to protect what remains. Really pleasant and easy downwind sail to Rousay, an island of about 200 inhabitants virtually all involved in sheep and cattle raising. Sheep and cattle are raised for meat, not dairy and until recently the wool from the sheep, who are sheared for the summer, was burned since the low price of wool did not make it worthwhile to take to market, shameful waste. However, the islanders recently discovered that they could market the fleece as home insulation and the wool is now a useful addition to the local economy. Rousay was subject to highland clearances in the mid-nineteenth century and the island hills are littered with roofless, derelict stone cottages, the only remnants of the hundreds of people who were thrown off the land to make room for raising sheep for the benefit of the island’s landlord. 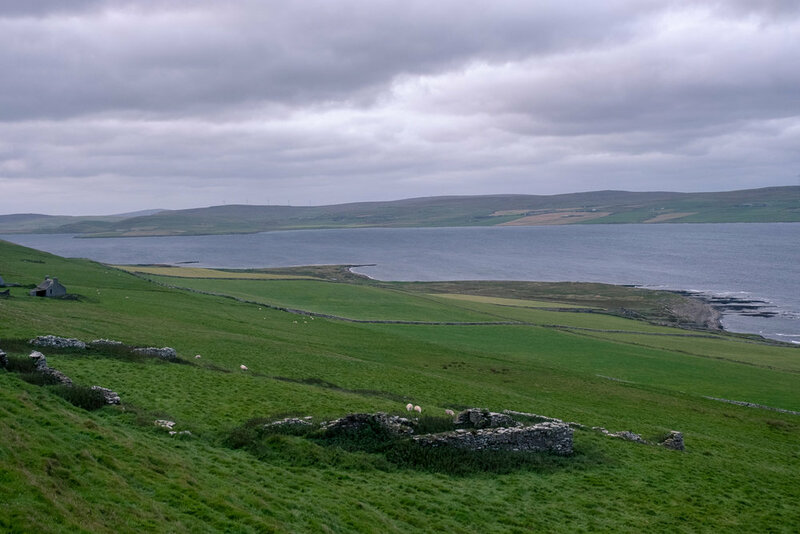 The island, small as it is at 18 sq miles, also has evidence from every stage in the history of Northern Europe, with a Neolithic settlement, Bronze Age burial mounds, Iron Age crannogs (man-made islands), brochs (defensive stone towers), Viking boat burials and medieval churches. One of the pictures in my last post pictured a ruined manor farm with a large stone tower which I supposed was an outbuilding associated with the farm. Couldn’t have been more wrong, it was a very well-preserved example of a broch which was at least 2000 years old! Off in mid-morning on Friday for an easy 20 mile motor sail to Stromness, the winds still being against us. We had planned to sail through a passage between two islands to our south and so through to Stromness. However we had not reckoned with the strength of the currents that run between the islands. The Shetlands and the Orkneys are hard areas to sail, currents and tide have an enormous effect on sailboats and planning a course of sail must take these into account. In our case they made what was to have been a 3 or 4 hour sail into a marathon. We spent the first hour of our journey trying to make headway against the current and were barely moving forward, we then turned tail and put the ship in the opposite direction. In order to work our way to Stromness we then needed to make a giant circle out to sea and creep our way against the wind but more importantly, not against the current. As a result we arrived in Stromness at 10pm after an 11 hour sail rather than the the 4 hour ride that we had expected. We were now down to our final two days of sailing before arrival at our final destination of Ullapool. And we really did save the best for the last! 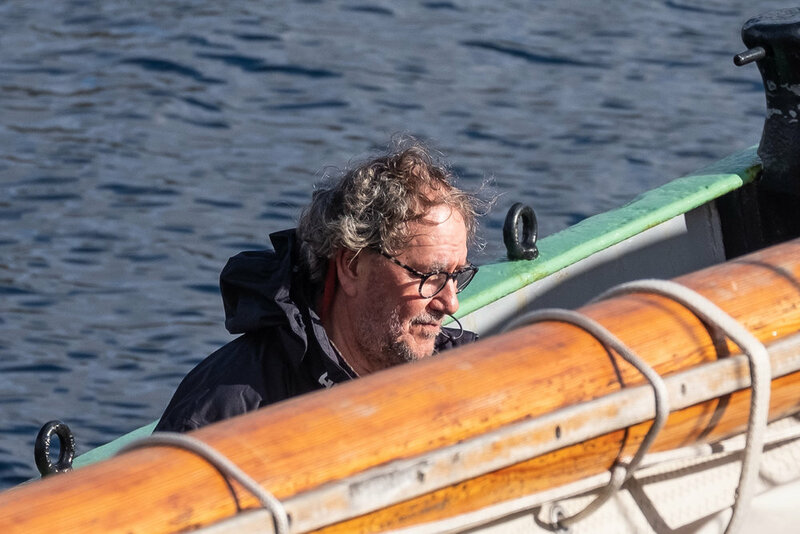 Winds were forecast to be Force 7 gusting to Force 8 from the south with high seas and when we cleared the Stromness harbour on Saturday, motor sailing under staysail and mizzen, we hit the full force of winds and waves. We were motoring into the teeth of the wind and waves and standing on deck, in itself a task unless securely attached to a piece of the ship, waves would rise up taller than you were standing on deck and you needed to look up to see the wave’s top, which was being blown to spume by the force of the wind, and the bow pointing up in the air, would then come crashing down into the valley between waves, shipping seas over the decks. Virtually everyone found a spot to roost on deck, wild as it was, since below decks it was punishing. No handholds and trying to walk along the companionway to the galley or standing in your cabin was asking to be slammed from one wall to another. Your choices were to be on deck and soaked wet and cold but able to see the waves coming and prepare for them, or to climb into your bunk and wedge yourself in by your arms and legs but have no way to anticipate the next roll and heave of the ship. This went on until after midnight, when the wind abated and the seas flattened and the ship began to ride much more easily. Dawn brought a clearing sky and the wind moving around out of the west. We had a glorious sail into Ullapool under our staysail and main butterflied wing on wing with our wake creaming behind us. V had positioned herself on the lighthouse at the harbour mouth and I got a text from her as we cleared an island near the harbours mouth that she could see the ship just coming in to view. Another magic moment of the many on the trip. Arrived at about 3 in the afternoon, brought down sails, coiled lines and cleared the decks for the last time, a little sad but great to think about hot showers and still beds. Gijs invited V to join us for our final dinner on the ship so off with her to the hotel to shave for the first time in 3 weeks, a very long hot shower and as a mixed blessing, a return to the wider world of Doug Ford, Trump and all the other matters that we have been away from for the last 3 weeks. However, one thing that I’ve been looking forward to is seeing V. We’ve been together for 25 years and this three week period is the longest that we have been separated. She was waiting on the dock as the ship pulled in and couldn’t have been happier to see her there. So, together again we’re going to spend the next two weeks on a photo expedition to Skye and the highlands. Looking forward to good restaurants, easy traveling and warm beds. Feel they are richly deserved! Photographer and traveler. Cook and food adventurer. My aim in writing this journal is to give heart, and hopefully some suggestions, to those of you who would like to travel in a different way. We love to try new things, to keep the scale very small and to take the best pictures we can.